The Dock preference pane lets you customize how your Dock looks and acts. The Dock is one of the Mac’s great organizational tools. It serves as an application launcher as well as a way to gain quick access to commonly used folders and documents. It has been around not only since the beginning of OS X but also was part of NeXTSTEP and OpenStep, the operating system developed by Steve Jobs after he left Apple in 1985. The Dock appears as a row of icons along the bottom of your Mac’s display. By using the Dock preferences pane, you can adjust the size of the Dock and make the icons bigger or smaller; change the Dock’s location on your screen; enable or disable animation effects when opening or minimizing applications and windows, and control the Dock's visibility. Click the Dock icon in the System Preferences window. The Dock icon is usually in the top row. The Dock preferences pane window will open, displaying the available controls for customizing how the Dock operates. Feel free to try all of the controls. You can't hurt anything, although it's possible to make the Dock so small that it's difficult to see or use. If that happens, you can use the Apple menu to return to the Dock preferences pane and reset the Dock's size. Size. Use the slider to set the Dock’s overall size. The maximize size is determined by the number of icons in the Dock. You can't make the Dock so large that icons are pushed off the screen. The changes you make with the slider are shown in real-time, so give the slider a nudge and see what happens. Magnification. Magnification expands the icon your mouse is hovering over in the Dock, as well as a few icons to each side of it, in order to show a better view of the selected icon. This can be useful if you have a lot of applications and folders in the Dock, and the icons are very small. Place a checkmark in the box next to the Magnification slider if you want to enable magnification. Position on screen. There are three possible screen locations for the Dock: Left, Bottom, and Right. Bottom is the default location. If you're using a laptop, you might prefer to place the Dock along the left or right side of the screen, so it takes up less screen real estate. Try all three locations to see which one you like best. Double-click a Window's Title bar: You can use the dropdown menu to select zoom or minimize. Zoom expands the window to fit the space between the Dock and the menu bar. Minimize shrinks the window to an icon that is placed in the far right end of the Dock. Minimize windows into application icon. 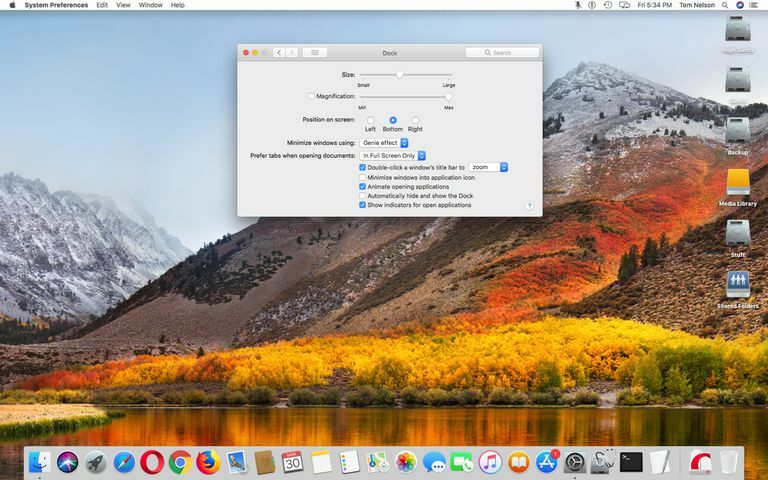 When a window is minimized it is usually placed as an icon in the far right end of the Dock, if this option is selected, the window is minimized to the parent app icon in the Dock. Minimize using. Use the dropdown menu to select one of the two effects: Genie Effect or Scale Effect. These visual effects occur when you minimize a window using the yellow button in the top left corner of the window. The Genie Effect causes the window to shrink down to the Dock as if it's been sucked into a genie's lamp. The Scale Effect collapses the window until it fits within the Dock. Try both effects and see which one you prefer. Animate opening applications. If you place a checkmark next to this setting, an application's icon will bounce when you launch it from the Dock. The bouncing icon confirms that you clicked the icon you meant to click, so it's a good idea to leave this feature enabled. Automatically hide and show the Dock. If you have limited screen real estate, you can set the Dock to slide out of view when it's not in use, and then reappear when you move the mouse cursor to the bottom or side of your display, depending on where the Dock is located. We recommend leaving the Dock visible because it lets you see which applications are currently active, but it's really a matter of personal preference. Place a checkmark to hide and show the Dock, or leave it unchecked for the Dock to always be visible. Show indicators for open applications. This will cause a small dot to be displayed just below the icon of an app in the Dock if the app is open. Make your selections and then try them out. If you decide you don't like how something works, you can always go back to the Dock preferences pane and change it again.